Mario is going on sale to celebrate himself. New Super Mario Bros. 2 is coming to the 3DS on August 19th and Nintendo is discounting a handful of his eShop games. The sales are staggered up through the release of NSMB2, but the collection features some groundbreaking mobile Mario action. Hang out and play some Mario before you play Mario. 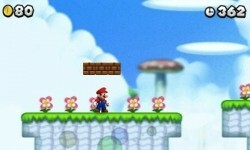 First up, Super Mario Bros ($3.99 from July 26 to August 1). That’s right, the OG SMB. ‘Nuff said. Then it is Game Boy time with Super Mario Land ($2.99 from August 2 to August 8). One of the quirkier Mario titles, but it’ll test your platforming skills like no other. Super Mario Land 2: Six Golden Coins ($2.99 from August 9 to August 15) modernized the Mario gameplay a bit on the Game Boy. Of course, it also introduced my personal favorite Mario villain, Wario. Finally, Mario’s Picross ($2.99 from August 16 to August 22). While I was hopelessly addicted to its sequels, I’ve never played the version that started it all. Definitely an interesting mix of Mario titles. I hope your thumbs are ready because your wallet has no arguments this time. The Best Super Mario Bros. Game Ever?